A hot topic discussed at the recent ceda Technical Conference was Kitchen Fire Suppression Systems. The session provided an update on the types and uses of fire suppression systems in commercial kitchens, as well as new developments and the future direction for protection. To follow up from the Conference, at the Fire Safety North exhibition, held 9th-10th October in Manchester, BAFE officially announced their latest scheme to be made available for third party certification assessment. BAFE Schemes Manager Chris Auger with John Davidson, Head of Field Operations (Systems) for NSI and NSI mascot Cash the Owl at the Fire Safety North exhibition October 2018. 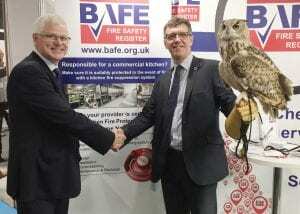 BAFE, the independent register of quality fire safety service providers, have been developing over the last two years BAFE SP206, a new third party certification scheme that covers the design, installation, commissioning, recharge and maintenance of kitchen fire suppression/extinguishing systems. Fire industry/insurance data reveals food and drink related fires are statistically the third most likely cause of large fires, also accounting for nearly 10% of all large loss fires. Fires involving restaurants and cafes represent some 42% of all fires within the food and drink sector put together. Developed with industry experts from Ansul, Amerex and Nobel Fire Systems, alongside Certification Bodies NSI and BSI, and chaired by Dr. Jim Glockling of the FPA, this scheme enhances the level of quality for these specific works to ensure a safer working kitchen environment but also to aid in the reduction of kitchen fires escalating to an uncontrollable and dangerous situation. The BAFE Kitchen Fire Protection Systems (SP206) Scheme will be available for third party certification assessment via NSI. Please visit the BAFE website for more information www.bafe.org.uk.